Your first purchase or second it makes no difference it can seem difficult to deal with, it is the unknown. Prokil Building and Pest Inspections can help with that unknown feeling by completing a thorough Building and Pest Inspection. We will coordinate with the Real Estate Agent or Tenant. Make the appointment and confirm all details for you. We always invite you to attend your pre-purchase inspection, so the inspectors can walk you through the finding at the end. 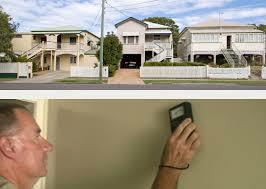 Our Building and Pest Inspection team are both Certified by Queensland Health and QBCC. Two inspectors qualified and years of experienced in their field of work. Our mature team of inspectors coordinate the inspection for the best results. The digital world has made our office paperless and more productive with streamline reports being delivered to our customers devices the same day. The reports which will contain all images of any issues discovered from the inspection for your reference. Your Pre-Purchase report is designed to give you independent and objective advice about the integrity of the property. It will expose any hidden surprises before you are committed to buy. Termite Inspection to your home is to probe, look-over scrutinize and observe conditions that are likely to attract or cause termites to seek out your home. Some of the easily perceived areas that could possible attract termites are sometimes missed. Moisture and timbers are the only factors for termites to survive and most homes have more than enough. Water leaks and moisture can be visible on the external of the building but can also be hidden inside the property, the source of water intrusion can vary from failures in fixtures or plumbing. 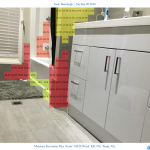 Bathroom areas are a significant area of breakdown to materials from moisture. 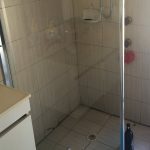 Constant use of shower cubicles can have an effect on the tiles, grout and sealant. 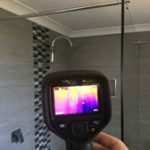 Signs of black mould in the grout lines or sealant consists of moisture build-up that has penetrated through to the back of the tiles in the shower cubicle and is always possible that the moisture has penetrated through to the structural timbers. A constant supply of moisture provided could attract not only decay to the timbers but could be a gateway for termites to the timbers that is available inside of your property. One of the most common cause of moisture that is found in shower cubicles is caused by building movement and settlement. 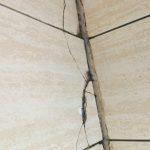 This causes weakening or cracking to the grout or to the waterproof membrane behind the tiles. Some of the older properties do not have the waterproof membrane as it was not compulsory. Tiles and grout are supposed to stay in place for long periods of time but that does not last forever and grout can break down. 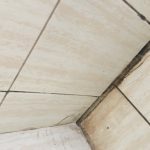 Deterioration to a shower cubicle not only looks unsightly, but the timbers behind the shower cubicle tiles will start to take on the moisture supplied, and decay is inevitable to the timbers and that could be a red flag to attract termites. Are there termites in your home? There are many conditions around your home that can attract the attention of termites, some obvious like the leaky external tap or overflow pipe from your air conditioning unit. Termite shelter tubes found to the external wall. The average repair cost for termite damage to a house can be thousands. The pest inspection is essential if you are purchasing a house, it is part of your due diligence process. The cost of a building and pest inspection is minimal comparison to buying a home with termites that could be catastrophic. As a seller it can be a smart move to have a building and pest inspection done before putting it on the market that way you know up front of any concerns that can be rectified before a potential buyer sends their own inspectors through your property. Might even help keep your market price. As a purchaser finding your potential new home that does have a few concerns you may be able to negotiate a full termite management system to be installed and any repairs need to be done at the cost to the vendor. 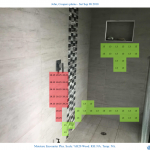 Moisture mapping on the affected area allows us with superimpose grid with corresponding moisture levels for all the building material we test in the Inspection to identify the location of the affected areas. The corresponding moisture levels can easily be identified in the mapping which allows us to put a visual on paper for you to see what we are looking at.